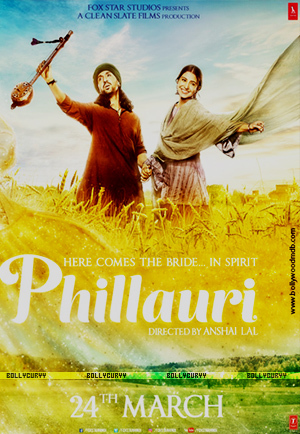 One of the most anticipated movies of the season, Phillauri, starring Anushka Sharma, Diljit Dosanjh and Suraj Sharma of Life Of Pi (2012) fame, will hit the silver screens on 24th March. Directed by debutant Anshai Lal, this quirky romantic comedy is Sharma's second venture as a producer and her first outing as a rapper. Set against the rural backdrop of Punjab, Phillauri revolves around a friendly spirit essayed by Sharma, who interestingly resides in a tree. The album, composed by Sashwat Sachdev with Jasleen Royal as a guest composer, comprises of a total of nine tracks including five original soundtracks, a rendition of a Punjabi folk song as well as a Punjabi version and a reprise of the said folk song. While various lyricists have participated in penning the verses, what surprises us the most is the lack of familiar names in the singer's category. Nonetheless, the songs are hugely appealing with the cultural vibes of Punjab blended in well with a peppy musical style. BollyCurry had a listen to the album and here are our thoughts. The album opens with the romantic Sufi track "Dum Dum" sung by Romy and Vivek Hariharan. Composed by Sashwat Sachdev, this soothing melody is already a favorite amongst the listeners. Anvita Dutt's heart-warming lyrics add so much wealth to the song, making the track more meaningful than it may intend. The tune, which almost resembles a Qawwali, tends to awaken our hidden emotions which may make the listeners recall their old school romance, a feat which the verses easily triumph. Thus we feel this is a must add to our personal playlist. A complete contrast to the previous song is "Whats Up", an up-beat Punjabi wedding song written by Aditya Sharma with the usual Punjabi beats and instruments in the background. Singer Mika Singh and the multi-talented Jasleen Royal have lent their voices while Royal has also worked on the composition. Though we feel there isn't anything unique about the track to consider it as an exemplary piece, the song completely agrees with the vibes of a jolly Punjabi wedding and makes us share a few dhumkas once in a while. Moving on, the next track we have is yet another quirky, up-beat Punjabi number titled "Naughty Billo" sung by Diljit Dosanjh, Nakash Aziz and Shilpi Paul. It is this song which brings us the biggest surprise factor - Anushka Sharma rapping. We have to admit it is a great first attempt which adds flavor to the whole composition. The song lives up to the expectations of the youth with a variety of club music and tempo combined with some power-smashing dance moves. This is the one song we would recommend if you love to hit the clubs and dance till your legs hurt. Next in the album we have the most awaited track, "Sahiba", a melodious and emotional balled based on the timeless Mirza-Sahiba love story. Composed by Sashwat Sachdev, Romy and Pavni Pandey's vocals are so entrancing that we are left to wonder if anyone can perform this song better than them. The soft and slow music proves to make the composition more graceful and soothing to one's ears while Anvita Dutt is on a roll with this album as she pens the most soulful lyrics. A crowd favorite from the album, this song is definitely worth your time. "Bajaate Tumba", sung by Romy and Shehnaz Akthar, captures the fun and cheerful atmosphere of the town of Phillaur and its people. Lyricist Anvita Dutt and composer Sashwat Sachdev have tried to come up with a diverse track but the song somehow fails to capture the attention of the listener. It is a peculiar number with a few English verses thrown here and there making this a track you may not willingly return to. Composed and sung by Jasleen Royal, "Din Shagna Da" is a soft melody unlike her previous composition "Whats Up". We are in awe of her baby-like voice that can easily carry melodies as well as up-beat tracks. A rendition of a traditional Punjabi wedding song, this is one of Royal's earlier songs which went viral on YouTube. Either way, we love her songs and this one in particular. This track isn't the best out of the album yet we recommend you to give it a listen at least once. The album comes to a close with the release of two additional versions of the original song "Dum Dum". The first is "Dum Dum - Punjabi version" sung by the same artists but with the Punjabi lyrics penned by Shellee. Even with the change of lyrics or the language, we don't find much of a difference between both the versions as they both give us the same enchanting feel. Following this is the last track of the album "Dum Dum - Reprise" by the ever-talented Diljit Dosanjh. With Dosanjh being part of the film, many expected him to have a major role in the music, but we were surprised to find him being a part of just "Naughty Billo". However, the release of the reprise version of "Dum Dum" is a breath of fresh air as Dosanjh fans can enjoy his addictive voice adding depth to this mesmerizing song. Anushka Sharma is an actor who experiments with her movie genres and we believe that the same was done with the film's music as well. With the absence of recognized singers from the industry, the album could have been a disappointment to the listeners. However, we discovered some heart-warming and alluring tracks which can be put on repeat on our playlists any day, be it to shake the floor or cry our eyes out. Thus, BollyCurry gives this album 3.5 out of 5. A special mention goes out to the lyricist Anvita Dutt who we believe did an amazing job penning down her lyrics. The full album of Phillauri is available to listen on YouTube and those who subscribe to Saavn. Do listen to the songs of this film as we believe you may be pleasantly surprised. Drop your opinions on the album and let us know what you think below.